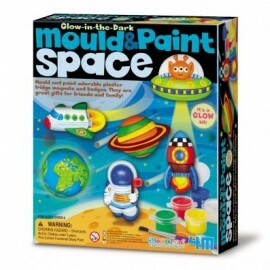 Mould and Paint Glow Space by 4M - spacekids - space toys, dressing up costumes, kids spacesuits, astronaut food, cool space stuff! Mould and paint a range of fun space objects like fridge magnets and badges with this kit! Includes everything you need to make 2 rockets, alien, planet and astronaut. Have fun painting your creations too! Pack contains moulds for 6 designs, plaster powder, magnet, pins, 6 colour paint strip with glow paint, paint brush and detailed instructions.